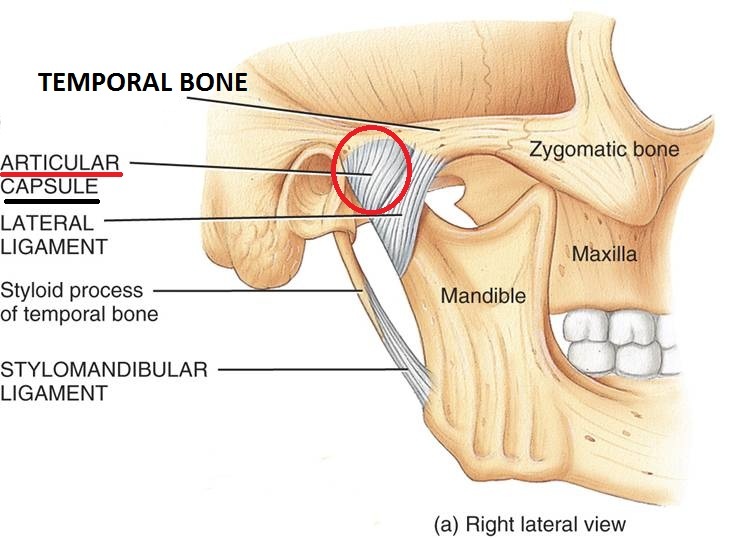 The temporomandibular joint (TMJ) or the jaw joint is a synovial hinge type of joint. This joint is responsible for the movements of our mouth that are needed for chewing, biting, talking and yawning. 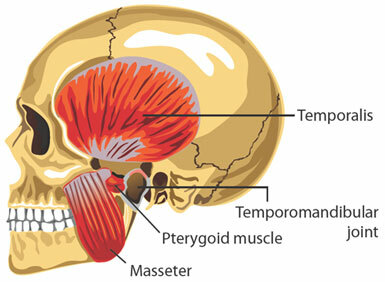 To achieve the complex movements needed by the jaw, the TMJ has two articulating surfaces which include the head of the mandible (jaw bone) that fits in the articulating socket of the temporal bone of the skull. In order to prevent friction between the two bones, an articular disc sits between the articulating surfaces which moves with the head of the mandible as one unit. Fig 2: Showing the attachment of joint capsule, lateral ligament and stylomandibular ligament. There is a combination of hinge and sliding motions that can occur in the TMJ due to the movements of the mandible. 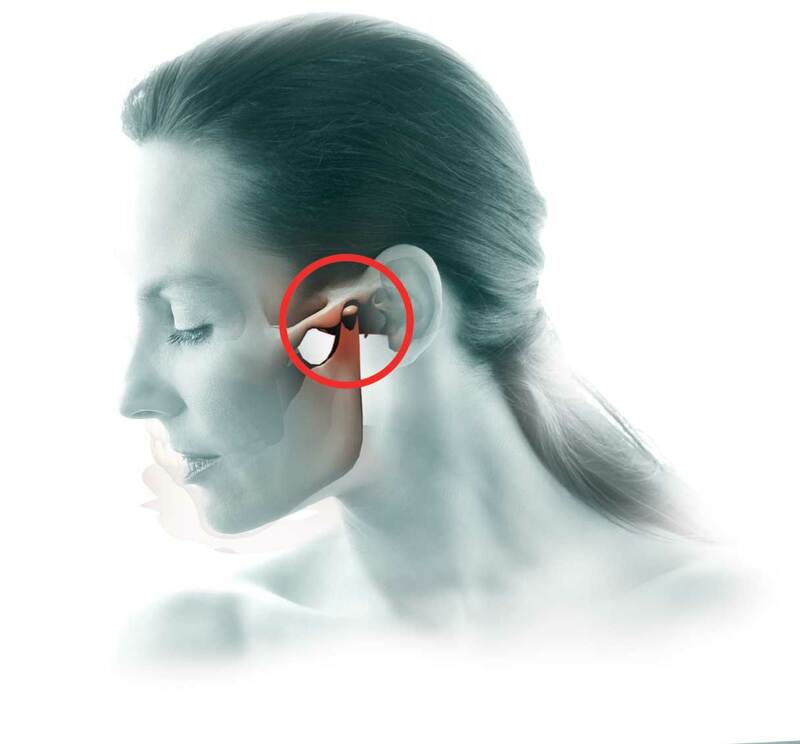 Muscular problem: Pain and discomfort in the muscles of the face during jaw movements. 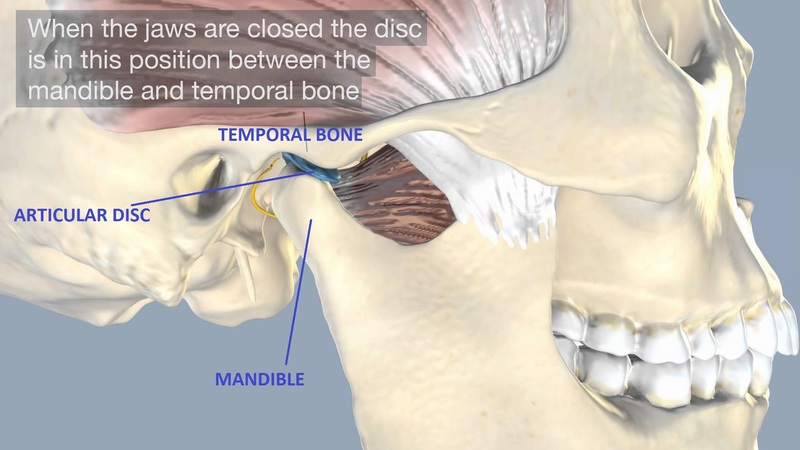 Disc problem: Usually comprises of displaced disc, dislocated jaw, or injury to the mandibular condyle. Joint problem: Degenerative inflammatory joint condition like Arthritis at the temporomandibular joint. Individuals who have misaligned jaw or teeth which are hereditary can be affected with TMJ disorder. Normally the jaw is free to move and make contact with the teeth in the right position, (centered occlusion), in anatomical and functional harmony. Mandibular overload occurs when one sleeps in a wrong position (face down) where the load of the head pushes the mandible to compress the TMJ on one side and attenuation of the ligaments on the other side. Compression obstructs the blood circulation and moves the teeth to a lateral bad occlusion position. In such a situation, swallowing causes the masticatory muscles to overwork to centre the jaw and bring the teeth from forced lateral malocclusion to centred occlusion. This causes a disharmony between the upper and lower teeth. An imbalance of the jaw that can cause bruxism in an attempt to re-position the teeth. The term bruxism is defined as an involuntary rhythmic or spasmodic non-functional gnashing, grinding or clenching of teeth. The rubbing causes tooth facet to wear out, structural and function damage to the capsulo-ligamentous and muscles around the TMJ. Stress and psychological problems could worsen the condition. Whiplash injury occurs any time when the head is suddenly and unexpectedly distorted from the neck, causing overstretching of the muscles and ligaments that hold the neck and head in alignment. During a whiplash injury, there is also a potential secondary injury of whiplash in the jaw. 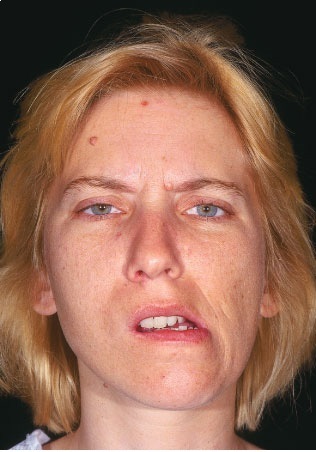 Jaw dislocation in severe cases can also occur. Sometimes infection in the teeth or adjacent structures can cause a spread of infection in the TMJ leading to infectious arthritis. TMJ could also be affected by osteoarthritis that causes damage in the articular cartilage of the joint and disc degeneration leading to friction between the bones causing inflammation and pain. It usually affects individuals above 50 years of age and is associated with trauma and other muscular and teeth problems. TMJ disorder could also be present among individuals who are already diagnosed of rheumatic arthritic disease. Jaw pain: Pain and tenderness in the jaws. Increasing pain during chewing in the TMJ and in the muscles, radiating pain is also felt in the face, jaw, or neck. Limited or painful jaw movement: Swelling due to the inflammation lead to joint stiffness and limited movement, wear and tear of the disc leading to locking of the jaw and impaired jaw function. Headache, Neck pain or stiffness: It is generally assumed that headache, neck pain, or painful jaw movement is suggestive of muscular problems. Masticatory and neck muscles may show muscle spasm and myofascial trigger points in the masseter or sternocleidomastoid muscles that refer pain to the head. Clicking or popping: This occurs within the joint during mouth opening and may indicate displacement of the intra-articular disk during mandibular movement. Ear pain and tinnitus (Ringing of the ear): Middle ear muscles have a common embryological and functional origin with masticatory (Chewing muscles) and facial muscles.Having said that, problems with muscles in TMJ disorder could affect the middle ear. In case, other ear problems are not the cause of ear pain and tinnitus a temporomandibular joint dysfunction may be the reason of these symptoms. In order to relieve pain and restore the function of the TMJ, a thorough assessment is required to correctly determine the causative factors and to treat the involved structures. Personalized care interventions at an early stage that includes behavioural change and reassurance are important steps for prevention of TMJ disorder.